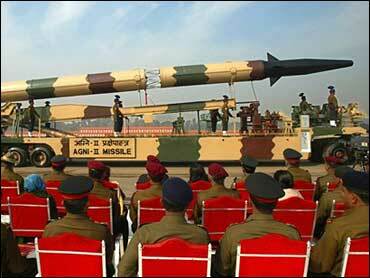 India test-fired its nuclear-capable Agni III missile Sunday for the first time, the Defense Ministry said. The launch took place at India's main missile testing center in the eastern state of Orissa, Defense Ministry spokesman Sitanshu Kar told the Associated Press. The launch of India's longest-range missile, able to fly 1,865 miles, has been viewed as a routine test - not saber-rattling with the country's nuclear-armed archrival and neighbor, Pakistan. New Delhi and Islamabad regularly test-fire missiles, but normally only give each other prior notice for long-range launches. It was not immediately clear whether India informed Pakistan ahead of Sunday's test. The missile was launched at 11:03 Indian time and "took off successfully," Kar said. "Details of the flight performance are being analyzed by the mission team." The missile splashed down near the Nicobar islands in the Bay of Bengal. Indian Defense Minister Pranab Mukherjee was at the launch complex, on Wheeler Island off Orissa, to witness the test, the Press Trust of India news agency reported. The Agni III further boosts India's homegrown missile arsenal, which includes the short-range Prithvi ballistic missile, the medium-range Akash, the anti-tank Nag and the supersonic Brahmos missile, developed jointly with Russia.